Pulsehyip has created this blog for business owners, startups, professionals and blockchain enthusiasts to learn about what is blockchain technology in banking and how blockchain technology assist for banks, how banking and financing section are beneficial by embracing the blockchain technology. Let's Talk about the blockchain technology for banks. We all are aware of frauds that have been faced by the banks in recent years. In the face of today’s financial landscape, the centralized banking system has the potential to prone the data breaches and failure. This kind of scams can be avoided by using Blockchain Technology. What is blockchain technology? How blockchain is fruitful for banks? The blockchain is a public ledger, open technology, transparent and secure enough to save all financial assets like money, equities or bonds. So Banking and financing section is one of the most obvious use cases for blockchain. 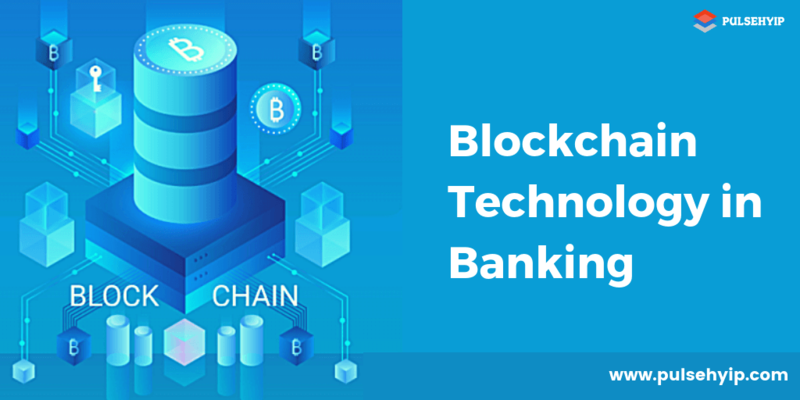 Blockchain technology has the potential to solve data hacking issues in the financial sector by making both internal processes and processes involving multiple parties faster, cheaper and safer. We all know in Feb 2018 PNB of India detected a fraud. If Blockchain technology had been used by the bank’s ledger system, then the PNB scam would have been detected quite earlier. Most of the banking systems are pretty much dependent on financial data analytics firms and rating agencies to verify the user's identity. The blockchain can eliminate this verification factor as all transactions are publicly available on the ledger. with the help of blockchain technology, the independent verification of each client by one bank or financial organization would be accessible for other banks to use so that the KYC process doesn’t have to be restarted again. Meaning that the duplication of efforts would be eliminated by the help of blockchain technology. Blockchain can hold the records of smart assets in digitalized form and get them updated in real-time. A smart asset system would not be limited to the entries of just assets moving from one place to another, but it can also tracking where a particular asset is delivered and where has it comes from. Banks and the financial sector can increase the speed and simplify the complex process by using smart contracts in financial transactions. This will also ensure the transaction and transaction will be approved only if all the written conditions of the code are met. Moreover, as these terms are visible to all the parties who involved in the transactions, the chances of error at the time of execution are dropped drastically. Bankers usually have the trust on credit scoring companies to decide who should be issued with mortgages, credit card debt, asset-backed securities, and corporate bonds. Through the blockchain transparency, anyone would be able to check the creditworthiness of the other person. Blockchain technology can reduce both the risk and expense of counterparties and enables more empowerment for customers to control their information. Blockchain helps to simplify the whole process like, identify who owns what, by increasing efficiency. Most of the banks using the blockchain technology to reduce their time to settle transactions. Customers can receive verification in a few minutes rather than taking the 1-3 days to verify the transaction. Banks can reduce interactions with third parties and intermediaries by implementing smart contracts within the blockchain banking platform. It can reduce costs for executing and maintaining the contracts. Not only Banking and financing sector, but business owners can also start their other kind of businesses with blockchain technology. Even business owners can start their own bitcoin bank with blockchain technology. in bitcoin banks, bitcoin users can get all the banking facilities like deposit and withdraw their cryptocurrencies, investment, lending or loan, the crypto transaction from one account to another, shares, Bitcoin exchanges and more. Pulsehyip is the provides best bitcoin banking solutions with blockchain technology to start your own bitcoin banking business with blockchain. The banking and financial institutions have started to realize the potential of blockchain technology for strict jurisdictions around the banking sector. In this digital era, the traditional business model is fast fading… To sustain in market share and to beat the competitors, it’s essential to redefine your business models. So Most of the organizations are also heavily investing in blockchain based solutions to develop their business. By hiring the dedicated Blockchain developers from Pulsehyip, you can start your business with blockchain technology.